While it's understood that mistreating one's restaurant waiter might backfire with a spiteful tampering with one's food in the kitchen, the notion of disillusioning other service-providers (whether through disrespect or under-payment) is too often forgotten. Whether its a doctor's office or videographer we must trust to care for our precious needs, resentment and spite can be a detrimental dynamic. 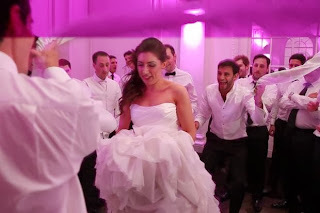 When a gentile wedding videographer perceives that a yuppie couple is splurging on other services, but skimping on his videographic efforts, and his resentment- evident on the audio track of the wedding day recording- there might be trouble with his effort. Compound his feeling of being underpaid with the offenders being better-off, but culturally lesser Jews, exacerbated by 2-decades of tolerated anti-Israel/ anti-Semitic fomenting by the British (and European) media (with insufficient rectifying by the Jewish establishment) we wind-up with an imbroglio spread across the pages of British newspapers. Are Britain's minority, affluent Jews the undeserved victims of this anti-Semitic brouhaha? Is this a product of the families' conduct? Should they know to only hire their own kind? Or is it a manifestation of years of failure to redress anti-Semitic reportage of Israel-Palestine conflict? And how will the claim (and exposure) of anti-Semitic treatment from the videographer affect future treatment of British Jews and allegations of anti-Semitism? Watch the video, courtesy of the Jewish Chronicle. Muslim assistant replied, "That's why Holocaust"
A newly married couple were shocked when they requested a copy of video footage of their wedding day and it included the cameraman’s anti Semitic rant and criticism of the bride.